Harry Fearn was selected to play for Staffordshire at Broughton Heath Golf Club in Derbyshire on Monday 30th and Tuesday 31st July as part of a six boy team. 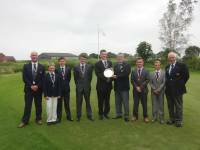 Staffordshire, Derbyshire, Lincolnshire and Nottinghamshire were all playing for the title of Four Counties Champion. Going into the event Nottinghamshire were the favourites as their team had the lowest handicaps and they were retaining champions. Each player played a scratch match game against another player from the different counties. Harry had a fantastic start and beat his opponent from Derbyshire 6/5 on the Monday. On Tuesday morning Harry lost to his opponent 4/2. His final game was against Nottinghamshire and Harry had a flying start -1 after 2 holes, getting to 4 up with 5 to play the Nottinghamshire player pulled one back. On the 16th the hole was surrounded by water and the Nottinghamshire player missed the green and Harry went straight for the pin with a 5 iron. The ball settled to 12' from the hole and Harry converted the put for a birdie two. 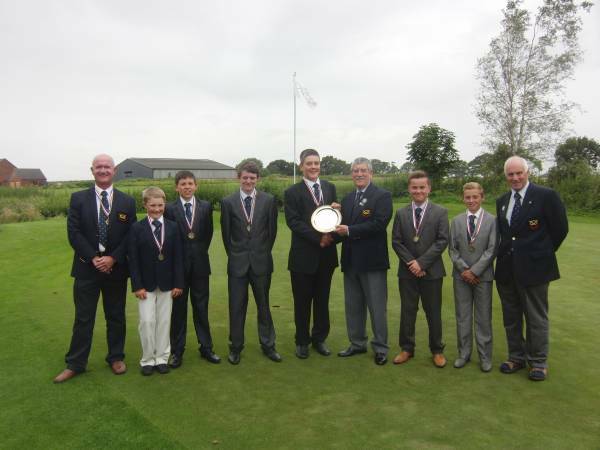 This performance helped Staffordshire win this prestigious event for the first time. Very well done to Harry and the other Staffordshire players.